And Katherine, being the much nicer person that she is, wrote back to thank me for a little treat of Elvis. ;-) My teasing didn't phase her one bit. 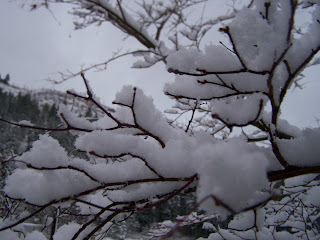 It snowed here on Friday - gorgeous flakes of soft snow that my boys loved. 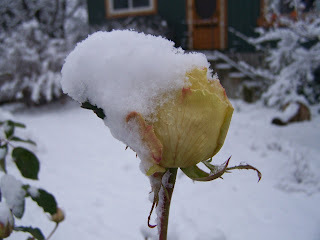 I took some photos to share with Katherine and wondered if she would be sending me a dose of my own back now that we had snow too. 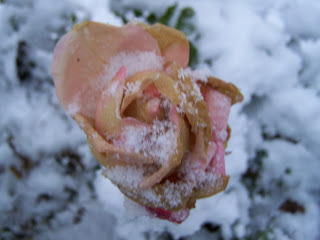 I'm not sure that my roses will recover as we have colder temperatures forecasted for this week. All of a sudden it really feels like winter. Wow! Look at all the snow!!!! I guess I should post photos of what it looks like here so you can envy me for a change. 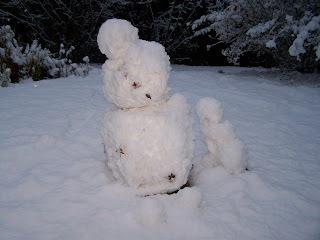 We don't have as much snow as you - actually most of our lawn is flake free and making a snowman would be impossible. ***I will be careful not to tease you too much as I know how this 'no-snow for us' situation could change rather quickly.